← Gone are the Days when the Ox Fall Down? The fear of runaway population, and the belief that it explains hunger, are old indeed; they even predate Malthus. But in modern times no one has beat these drums as loudly as Ehrlich. With this new population projection reviving old concerns, it’s a good time to think about Ehrlich’s victory lap and whether he has earned it. 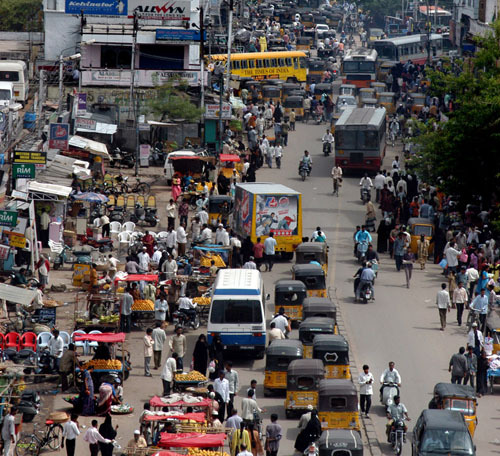 Indian cities are crowded alright. But then again, they are cities. I have understood the population explosion intellectually for a long time. I came to understand it emotionally one stinking hot night in Delhi a few years ago. My wife and daughter and I were returning to our hotel in an ancient taxi. The seats were hopping with fleas. The only functional gear was third. As we crawled through the city, we entered a crowded slum area. The temperature was well over 100, and the air was a haze of dust and smoke. The streets seemed alive with people. People eating, people washing, people sleeping. People visiting, arguing, and screaming. People thrusting their hands through the taxi window, begging. People defecating and urinating. People clinging to buses. People herding animals. People, people, people, people. As we moved slowly through the mob, hand horn squawking, the dust, noise, heat and cooking fires gave the scene a hellish aspect. Would we ever get to our hotel? All three of us were, frankly, frightened… since that night I’ve known the feel of overpopulation. The battle to feed all of humanity is over. In the 1970s and 1980s hundreds of millions of people will starve to death in spite of any crash programs embarked upon now. 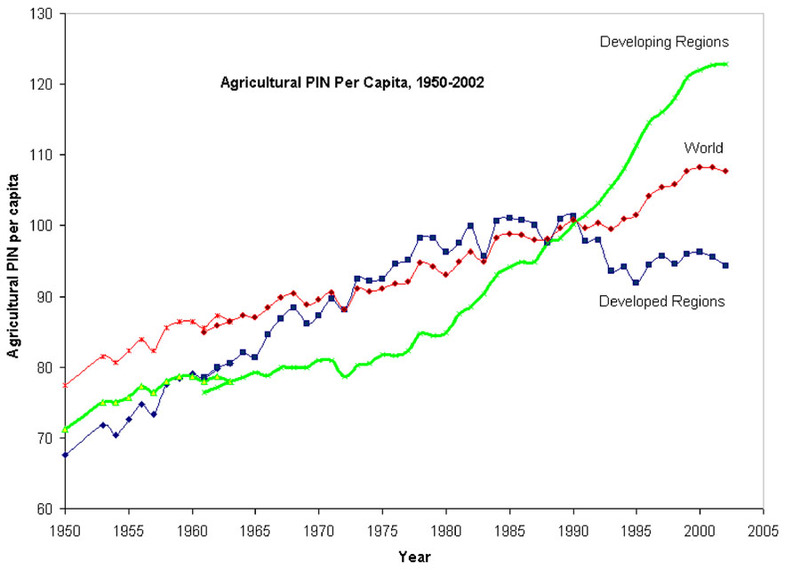 Trends in per capita Agricultural Production Index Number. Data from FAO. I know some elementary anthropology and I have to point out that Ehrlich’s claims about population and agriculture have never fit the facts. Farm production per capita was climbing in the 1960s, it has been climbing ever since, and the FAO sees it continuing to climb for as far out as they care to project (2030). India does have a lot of undernourished people, but it has nothing to do with population ourstripping farm production; in fact as I pointed out recently, India has an ongoing crisis of grain surpluses. OK, but just because Ehrlich has been wrong for the last 40 years, doesn’t this scary new projection warrant pulling the alarm? What’s the harm in trying to be safe rather than sorry? Actually there is a lot of harm. First, these projections are much too fuzzy to base anything on. To quote Joel Cohen (who, unlike most commentators, actually knows a lot about population), tiny changes in our assumptions about reproduction give wildly different numbers. If women average just half a child more or half a child less than the U.N. assumes, the population in 2100 rises to 15.8 billion or falls to 6.2 billion, which was the world’s population around 2001. The farther into the future you project, the more you are just guessing. We have no theory to predict the reproductive behavior of people who have not even been born yet. But more importantly, attributing hunger to population growth distracts attention from the actual (primarily political) causes of hunger while yielding the floor to the politicians, academic researchers and corporations that benefit by promoting agricultural inputs. After all, if we really are in a desperate scramble to create food, then all these discussions about sustainable, organic, local, and humane farming are a dangerous distraction. On the other hand, if we are making ourselves and our environment sick with agricultural systems that grow faster than the population, then it is writing like Ehrlich’s that is the dangerous distraction. This entry was posted in Agriculture, Food and tagged population agriculture malthus. Bookmark the permalink. This is a topic that I grapple with on my nutrition research in China. On one hand, advances in agricultural technology are arguably what has helped feed China’s population and pull hundreds of millions out of poverty in the process. Continued “successes” in agricultural technology will no doubt continue to have such an impact on China’s economic future. On the other hand, these industrial agri-farms are extremely controversial in China as well. Food safety issues continue to cause havoc in a country where regulation is spotty at best. There is little oversight or consumer protection, and it seems no one truly trusts where their food comes from anymore. The organic farm movement is picking up speed in China, and farmers in the countryside are notorious for having two farming plots: one for selling (rich in pesticide/herbicide use), and one for eating (essentially what we westerners would call “organic”). I have yet to meet a migrant here in Shanghai who doesn’t long for their home-grown garden and food. There are now organic foods being sold in the cities, but the price tends to be 8-11 times higher than conventional food, unfortunately out of reach for many here. Meat consumption is also on the rise in China, which is cause for a host of other problems. Land that used to be for growing vegetables is now used for feedlots. Corn that used to feed people is now feeding cows. In order to continue to not only feed China’s bourgeoning population, but feed it what it WANTS, China is now importing food from places like the US, and they are also in numerous “land-grab” disputes the world over. While I have yet to become a “dooms-dayer”, I continue to struggle with this subject and blog about it often myself. No matter what China decides to do in the immediate future, definite changes are on the horizon. And if Chinese people have any say, an organic food movement will play an important role. Don’t you think that one of China’s great lessons is the need look at agricultural “advances” with a discerning eye. I think Francesca Bray’s The Rice Economies should be required reading for everyone interested in food production, with its rich accounts of the phenomenal productivity of wet rice with ingenious but simple technology. China’s famines have never been because of the way its agriculture worked, but because its agriculture wasn’t allowed to work. I would expect Chinese feedlots to be a real hazard. We obviously have a vastly superior food safety system in the US, and our feedlot meat supply is still filthy. I hope China can develop and implement organic certifications that work. As we see in the US, it is an ongoing (and not entirely successful) effort to keep it from being appropriated, and it still doesn’t work for thousands of small farms producing just the products that most organic consumers want.